Labels are always an after thought when it comes to creating, you use it to tell which way is which or the size but after stumbling upon a homemade dress at the thrift store and noticing no tag I realized that a tag can be used as a signature, years from now when I'm out of my black and white chevron phase hopefully someone will know that whoever this Tangible Artiste is, they put a lot of work and thought into this specific item and will take better care of it because it's handmade. Want to make your own labels, here is the easiest way EVER! Let dry since it was a nice day out I just hung it outside to dry, but since there is now snow on the ground in May you could always use a blow dryer or hang it up to dry inside. cut your labels out so that you can fold the bottom part up, and right sides facing together stitch the sides, trim seams, turn right side out, and iron flat. when you stitch your binding for the neckline just insert the tag and stitch into place. What a great idea! Can you please help me? I am curious about the ironing and printing portion. Do you iron the freezer paper to the front or back of the fabric. When printing, should the print end up on the ironed on freezer paper? I would love a little clarification. Thanks! HeatherG, I think you iron the shiny side of the freezer paper to the back (or wrong side) of the fabric. Cut the fabric/freezer paper to the size of a standard sheet of printer paper (just trace a piece onto the paper side of your fabric/freezer paper sandwich and cut out). Place into your printer so that when you print, it will print onto the fabric. 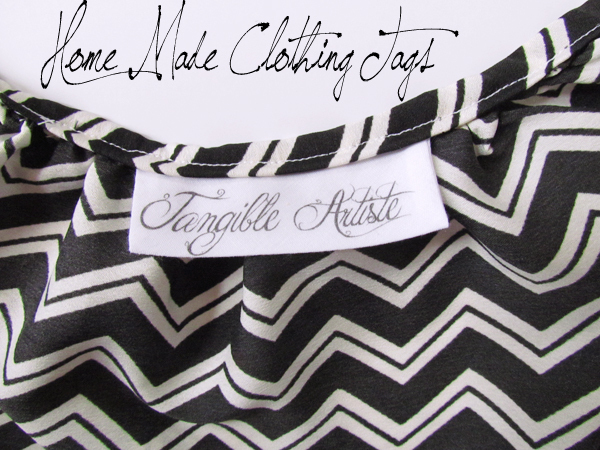 Proceed as above for setting the ink on your fabric and cutting out and sewing the labels. Hope this helps, though you probably figured this all out a while ago! Thank you Robin M for clarifying, I was confused also. Can't wait to try this!!! Labels are so expensive to purchase. Thank you Robin M for clarifying this point for all of us. Should printing on the freezer paper be done in "mirror" image? I've been wanting to know how to make labels for a long time. Thank all of you very!